Rivers, mountains, and trees are venerated in India as the earthly forms of gods and goddesses. 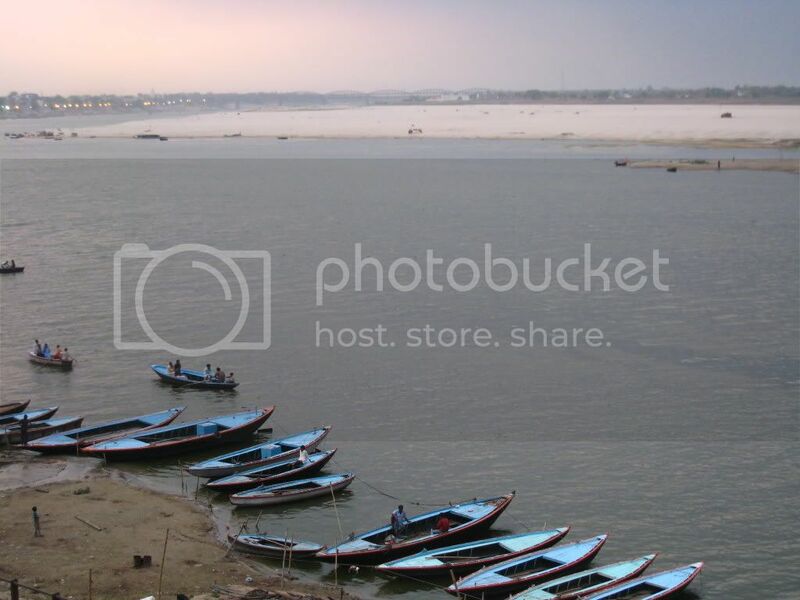 Ganga (the Ganges River, which originates in the Himalayas, flows through the northern plains, and merges with the ocean at the Bay of Bengal) is one of the most loved and worshipped goddesses. According to the ancient scriptures, Ganga was a goddess residing in Heaven who came down to Earth in the form of a river to provide salvation to the seven generations of ancestors of King Bhagirath. Not only did Ganga come to save Fing Bhagirath's ancestors, but she also went to Earth as a means of purification for the entire pouplation of human beings. 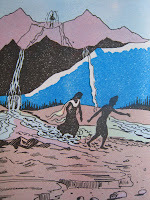 Beautiful, pure, strong-willed Ganga was the elder daughter of mount Himavan. She had the power of purifying anything that touched her. One day, the Devas (gods), came to mount Himavan. "Heaven needs the presence of young Ganga, sanctifier of all creatures." At about that time, life on earth was becoming impossible for all righteous people. Their mysterious tormentors were a group of Asuras (a race constantly at war with the Suras or Devas) who hid in the ocean by day and came out to harass them at night. In heaven, the Devas were perturbed by the plight of the people. 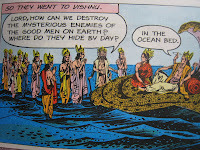 So they went to see Vishnu. "To kill them you will have to dry up the ocean. Go to sage Agastya. He alone can help you." 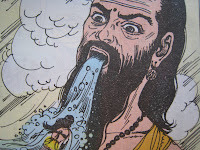 When Agastya had heard the whole story: "For the good of the world I will come and drink up the ocean." 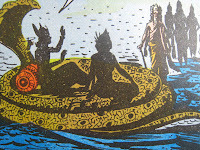 As Agastya bent down and began to drink up the ocean, the evil Asuras were exposed. The Devas fell upon them. When the Asuras were vanquished the Devas turned to Agastya: "O saviour. Now that the evil ones are dead, fill up the ocean again with the water you drank." " I cannot. I have digested it. You will have to find some other means to fill the ocean." 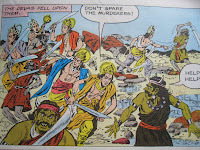 The Devas did not know what to do. They went to Brahma. "A very long time must pass before the ocean will once again be full." The Devas waited a number of years and still nothing happened. So they went to Vishnu again. "Do not worry. 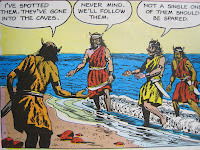 King Sagara and his descendants will cause the ocean to be filled up again." At that moment on earth, Lord Shiva appeared before King Sagara and his queens, Keshini and Sumati. "One of your wives shall bear 60,000 proud and heroic sons who will all perish without heirs. Your race, however will be continued by the one son that your other wife will bear." Accordingly, in course of time, both wives bore children. 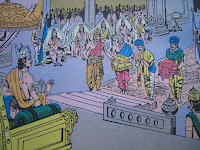 King Sagara was overjoyed and gave many gifts to the poor. Days passed and the boys grew up. The 60,000 sons of Sumati were brave, strong lads, who were conscious of their royal status. 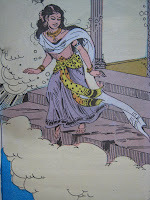 Queen Keshini's son Asamanja, however, grew up to be a wicked prince. 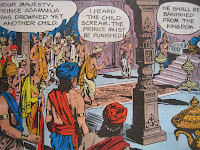 But Asamanja's son Amsuman was a very kind and considerate boy and the people loved him. 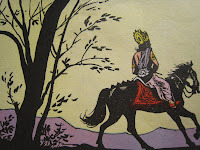 Once, when King Sagara was performing the Ashwamedha sacrifice... Indra stole the sacrificial horse. 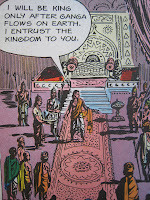 When they discovered that the horse was stolen, the officiating priest and Sagara turned to the 60,000 princes. "If we can't complete the sacrifice, we are all doomed. Go, my valiant sons! Go and find the horse." 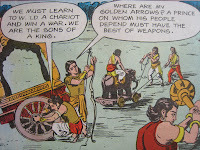 The sons of Sagara searched the whole earth but could not find the horse. At last: "There is only one place left to search the Nether world." When they reached the Nether world: "What is this huge elephant doing here?" 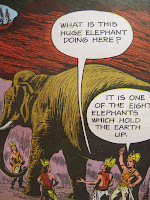 "It is one of the eight elephants which hold the earth up." When the Sagaras had dug the earth to tunnel their way to the Nether world, the panic-stricken inhabitants of the earth ran hither and thither. The elephant to maintain balance of their weight moved, causing a tremendous earthquake. Meanwhile, oblivious of the harm that they had done, the sons of Sagara moved on and came to where sage Kapila sat meditating. "There stands our horse. So this sage is the culprit. Thief! Return our horse!" 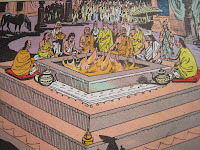 Angered by their audacity, the powerful Kapila burned the 60,000 princes to ashes by uttering but one syllable. 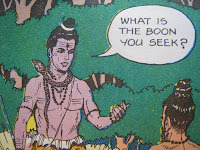 Meanwhile, at the sacrifice, when the princes did not return, Sagara remembered Shiva's words. He turned to Amsuman, his beloved grandson: "Go, Amsuman. You are valiant and wise like your ancestors. Go and find your uncles and the horse." Amsuman set out and soon came upon the place where his uncles had entered the Nether world. "Crops have been destroyed; people and animals killed! There seems to have been a calamity. I will enter this crater. Perhaps my uncles are in the Nether world. Ah! There is the horse. I will ask the Rishi about my uncles." 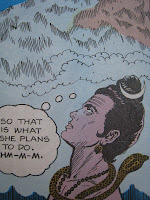 Amsuman came closer and saluted the rishi. "Have you seen my uncles? They came after that sacrificial horse." "Yes. I have seen them. They were so insolent that I consumed them with with the fire of my penances." 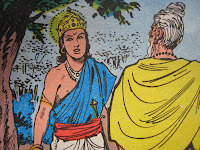 Amsuman took a handful of the ashes that were his uncles and let out a cry of anguish. The sage tried to console him. " Do not grieve, Amsuman. They met the fate they deserved." "But do they deserve to suffer in hell too? Is there no way for them to enter heaven?" "There is. 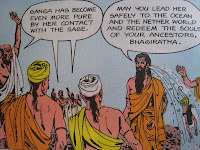 Ganga in all her purity must be brought down from heaven. If she touches these ashes your uncles will go to heaven." 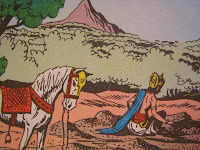 Amsuman returned with the horse. 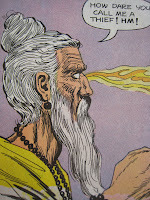 Later, at the palace, when Amsuman told Sagara what the sage had said: "Amsuman, you must become king after me and strive to bring Ganga to earth." When Sagara died, Amsuman became king. Amsuman however died without succeeding in his attempts. 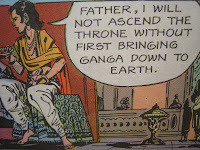 His son Dilipa was overcome by grief: "I must bring Ganga to earth in my reign." At last even Dilipa was on his deathbed, leaving the task unaccomplished. 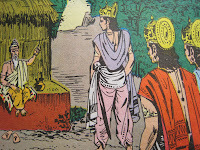 His son Bhagiratha, however, made a vow in the dying king's presence. 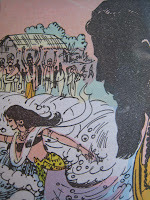 Accordingly, when Dilipa died, Bhagiratha addressed the ministers: "I will be king only after Ganga flows on earth. I entrust the kingdom to you." 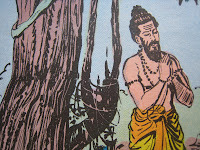 For years Bhagiratha continued his penances and meditation. 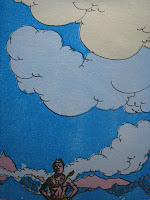 At last, pleased by his single-mindedness, Brahma appeared before him. "Ask for a boon, a steadfast one, and it shall be granted to you." "Then let Ganga flow to earth from the heaven and deliver the souls of my ancestors." "Your aim is a lofty one. 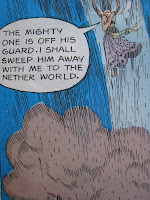 But the earth cannot sustain the force of her fall. Only Shiva can withstand it." For a year Bhagiratha adored Shiva. 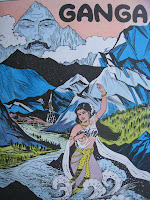 "Lord, please receive the force of Ganga as she descends to earth." In heaven, Ganga made ready to descend. Halfway down a thought suddenly occurred to her. 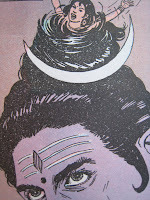 As Ganga fell, Shiva imprisoned her in his matted locks. She swirled about in her prison for many a year, unable to escape. Bhagiratha once again adored Shiva and the mighty god appeared before him. "Lord! You are the source of all kindness. 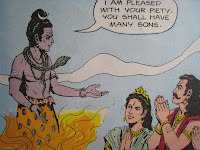 Have pity on me and release Ganga." "Your devotion merits it. For your sake I will. Lead her to the ashes of the sons of Sagara and may their souls be redeemed." 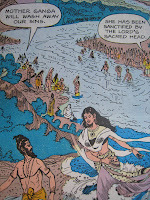 Ganga became further purified by her contact with the Lord's head. People ran to her to cleanse themselves of all sins. But Bhagiratha's trials were not yet over. "Where are these people going?" Ganga asked. "To the sacrifice of sage Jahnu." "I will flow that way." "You may. But do not disturb the sage. Take care. You'll flood the sacrificial fire and destroy ther sacrifice." 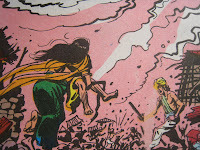 But the irrepressible Ganga rushed forward. The sage was furious: "You shall be punished for this!" And the fuming sage consumed her in one long gulp. "Forgive her, holy one, and release her." "Yes, O holy one. Let not the endeavours of Bhagiratha be wasted." Out of respect for Bhagiratha's penances, Jahnu released Ganga. 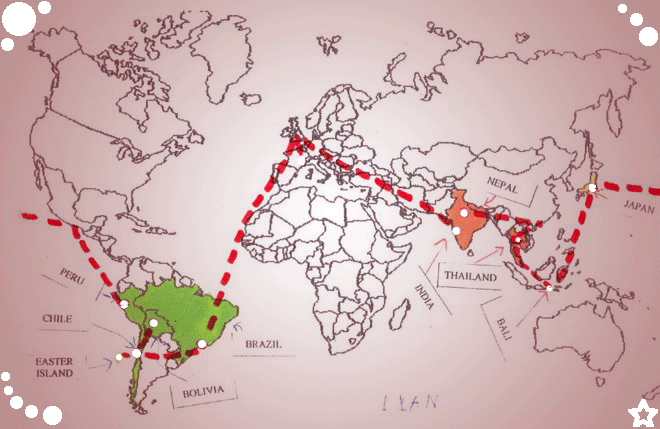 At last, Bhagiratha and Ganga reached the ocean and the Nether world beyond. Ganga flowed over the ashes of the sons of Sagara and onto the ocean bed. 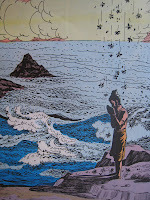 From that day onwards, the ocean came to be known as "Sagara". 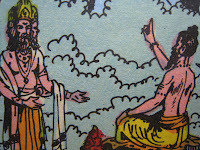 His promise fulfilled, Brahma appeared before Bhagiratha: "The sons of Sagara are in heaven and will remain there as long as Ganga flows on the earth." Then Bhagiratha returned to his kingdom, ascended the throne and ruled wisely for many years. C'est de toute beauté!! !Merci pour ce voyage en "live" ma chérie!A très vite...tu sais où ;-) Nadège. C'est Sandra qui nous a lancées sur ta piste et là, on se dit WHAAAAAAAOOOOOuuuuu ! Continue à nous faire voyager et profites-en bien surtout ! Emeline et Séverine de la dream team de la fac du Mans. Merci les filles! c'est super de vous retrouver la! Super tout ça Mme Paoli! Est-ce qu'on pourrait parfois avoir des textes en français ça nous simplifierait la tâche et est-ce qu'on peut avoir une explication du festival holi en français?